We are a mobile electric generator rental company based in the New York area, catering primarily to the entertainment industry. We are equipped for off-road location shoots, where 4 wheel drive vehicles are desirable. Our highly popular LitePower Generator is mounted on a 4-wheel drive truck for transport to the most remote location. 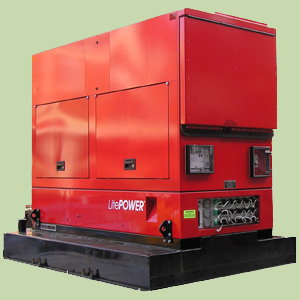 It is a very versatile 140KW 3-phase 1200amp generator. When required this unit can also be shifted to a trailer for towing. 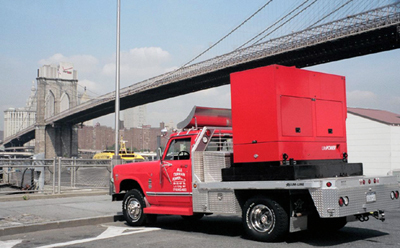 The 1400 amp tow generator is trailer-mounted and was built by the E&E Co. This state-of-the-art, motion picture location generator is equipped with a switch for 120 through 480 volts in 3 phase output as well as 120/240 volts in single phase output. The converted fire truck is a 4 wheel drive heavy, duty pickup truck with a 100 amp (12 kw) single phase (120/240 volts) hydraulic generator powered by the truck's own engine. It is equipped to tow our 1400 amp generator. See our equipment in use on-location, their versatility, and a few of our satisfied clients.